Yellow Jacket Nathan Rakitt didn't get past the first round. A nearly four-hour rain delay didn't dampen the spirits of tennis fans and the players as the 2014 BB&T Atlanta Open got underway on Saturday at Atlantic Station, with eight singles qualifying matches. The BB&T Atlanta Open is an ATP World Tour 250 event that not only kicks off the summer hardcourt circuit in North America, but also the five-week 2014 Emirates Airline U.S. Open Series which awards bonus prize money to the top-three finishers for both men's and women's play at the US Open in Flushing Meadows. Saturday's qualifying order of play featured a mix of players with local ties, doubles specialists looking to try their luck in singles and one of the top junior players in the world. Georgia Tech's Nathan Rakitt, a wildcard entry into the qualifying, played the first Stadium Court match of the tournament, taking on former University of Virginia player Michael Shabaz. 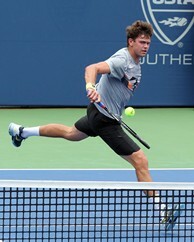 Rakitt, from Marietta, Ga., didn't blame the rain delay for his slow start in a 6-2, 6-1 loss. "There was a bit of uncertainty where we would play this match and a delay, but it was the same for him," he explained. The Yellow Jacket, who has played the qualifying draw at this event in the past, said a loss like this is all part of the learning process. "This time was Stadium Court and the warm-up was good. I hit an ace on the first point, but he's one of those guys that is going to scrap and make you play. He was definitely playing at another level today and my errors came early and often." In other early Saturday qualifying matches, South African veteran Fritz Wolmarans, who has had most of his success on the USTA Pro Circuit Futures and Challenger events took down Neal Skupski of Great Britain 7-6(2), 6-2 in a match that lasted 94 minutes. In a showdown that entertained a few dozen fans out on Court 3, Ryan Shane, a rising junior at the University of Virginia, outlasted doubles specialist Frank Moser of Germany in three sets. Moser, a regular in the BB&T Atlanta Open doubles draw, started quickly and aggressively against the young American. The German took charge of the net and took the first set 6-4, but Shane fought back to take a second-set tiebreak with his steady play, cruising to a 6-1 third-set win over a deflated Moser. The tournament introduced the Wild Card Challenge this year in which a local pro or student was given the opportunity to play for a qualifying wild card. Korey Lovett, who is committed to playing as a University of Alabama freshman, won the challenge. However, he fell in three sets to Facundo Mena 6-7(6), 6-5, 6-2. These three winners advance to the second round of qualifying on Sunday and additional qualifying matches will continue through Saturday afternoon at Atlantic Station.